I've been getting the Christmas decor out, and, playing with glitter. The little Christmas sign is a salvaged piece of wood. I painted it white, stamped on the message, and, gave it a dusting of spray glitter. 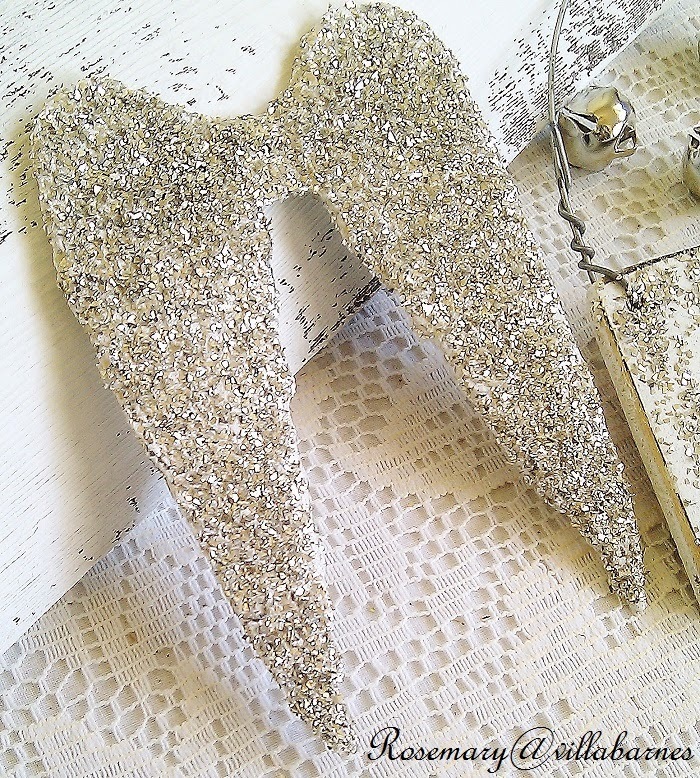 The edges are sprinkled with the same glitter I used on the angel wings. 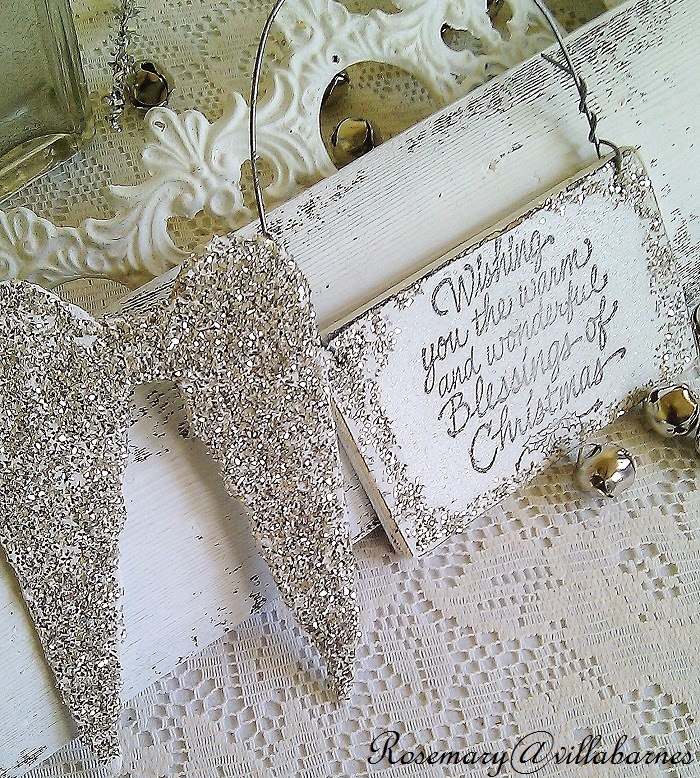 I cut the angel wings out of chipboard, painted them white, and, sprinkled on a bunch of vintage glitter. I picked up the glitter at an estate sale a long time ago, and, never used it until now. I sealed it with spray. So, the glitter stays put. It was hard to capture the true shimmer in these photos. Honestly, I'm taking my time decorating. I took this photo of my tree, and, I've already changed it. No rush, rush. No hurry, hurry. I'll be have fun decorating, and, share more photos soon. Oooohhh. Love that vintage glitter. Sweet and simple. I really downsized my decor this yr and I love it and feel much less stressed. I'm in no hurry this year either. A fellow blogger thinks she is going to see my house all decorated this Saturday when she picks me up for a Christmas tour. NOT. I love your sparkly angel wings and tree. I can't count the number of times I've posted a picture and wished I had waited...I am never done tweaking...ever. I love those angel wings, Rosemary! I usually stay away from glitter although I love the way it looks because it seems to get everywhere. What kind of spray do you use? I took my time decorating, too, and also wound up keeping things simple. I just wasn't in the mood to have a whole bunch of stuff out this year. Rosemary, you always create the most beautiful pieces! I agree with you. Take your time and enjoy the season. I don't even have a tree yet! Love that shimmery sign. You are so danged creative and think of the neatest things! Beautiful Rosemary. Love the vintage glitter. I am downsizing the Christmas decor this year and it feels wonderful to have it done early and less stress. Rosemary no hurry no stress sounds like wonderful advice. In our hectic busy lives it's such a treat to relax and enjoy making our homes festive for Christmas. 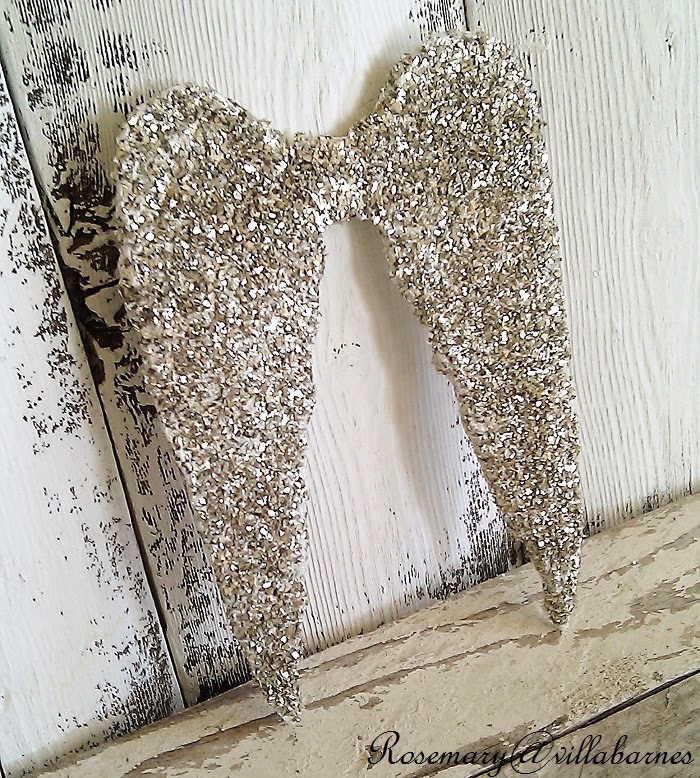 Love your glittery wings and things. Have fun decking your home. I'm glad to hear someone else is taking it slow and easy with Christmas decorating. I'm just going at it as the mood strikes. Your vintage glitter is stunning! Loving everything I see so far! 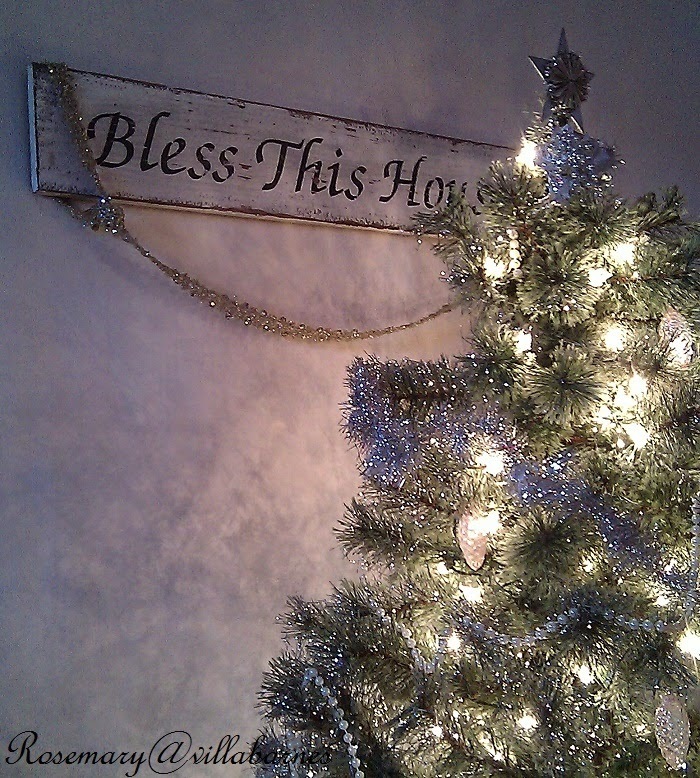 Love your silvers and lights, and I am so doing it simple this year, keeping it calm and with meaning. It's going to green up time for more important acts of kindness In our home town. I Love your beauty here Rosemary, and best I am looking forward to another year of all you inspire. Blessings this Christmas to you and yours. Your tree looks amazing! So beautiful.